A rare vulture was freed into the wilds of Thailand, after bird flu fears frustrated plans to send the young bird to nesting grounds in Mongolia. It was the end of a high-level bid to send the bird back to its homeland - a saga involving everyone from South Korean diplomats to Thailand's national airline, Thai Airways. The cinereous vulture was released along with four Himalayan griffon vultures in a mountainous part of northern Thailand near the Myanmar border, thousands of kilometers (miles) from its natural habitat. After an hour, the four brown-and-white Himalayan griffons flew off, leaving the black, cinereous vulture standing alone, stretching its wings. 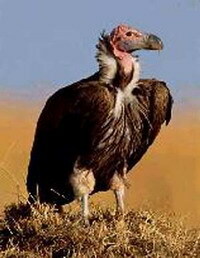 A veterinarian then picked up the cinereous vulture and threw it into the air, forcing it to fly off toward a ridge. Chaiyan Kasorndorkbua, who helped oversee the bird's recovery after it was found emaciated in Thailand, said he hoped it would fare better in the company of fellow vultures. "When we release them in a flock, it should be easier for them to find food," Chaiyan said. "But we still need to keep on praying. Hopefully, they will find the food and will fly on to China or Mongolia or any other country where they will spend the summer." Still, bird experts expressed doubts that the bird will survive in an environment where there is a shortage of carcasses to feed upon, and where illegal poaching is widespread. "It could get lost again," Gawin Chutima, chairman of the Bird Conservation Society of Thailand, said last month. "It's a young bird and has no experience." The bird - also known as a black vulture or monk vulture - is defined by The World Conservation Union as near threatened in Asia, where its numbers have steadily declined because of a loss of habitat, shortage of food and increased cases of poisoning. The population, however, has increased slightly in parts of Europe including Greece and Spain due to bolstered conservation efforts. Thai Airways first announced in March that it would transport the vulture to Mongolia to help the rare bird return to its natural environment. But Thai Airways and other officials involved in the transfer said in April that China had rejected a request that the vulture travel through Beijing, due to bird flu fears. A request for transit through Seoul was rejected over similar concerns, even though the bird was tested twice and deemed free of the bird flu virus, officials said. The year-old vulture, not found in Thailand, had been nursed back to health by veterinarians at suburban Bangkok's Kasetsart University after apparently getting lost in late December, and ending up dehydrated and near death in southeastern Thailand's Chanthaburi province. It is now about a meter (3 feet) tall with thick, brown feathers and an imposing black and white beak.